Port Moresby. What’s that smell? Why on earth are you going to Papua New Guinea is what I have been hearing for the past nine months while I have been planning this trip. Well Papua New Guinea (PNG) has the second largest rainforest in the world next to the Amazon. It is home to around 1000 tribes each with their own distinct language, many of which were discovered within the last hundred years. It is also home to thirty six different species of the Bird of Paradise. They even have exotic pigeons rather than the usual flying rats. With very few exceptions, these birds cannot be found anywhere else in the world. That is why I am going. I know that the crime rate in Port Moresby, the capital, is very high and that violence often goes along with it. But I am only going to be in Port Moresby for two nights, one at the start and one to finish. For the rest of the time I will be in central PNG where it is nowhere near as bad. Besides, Gordon and I are not going on our own. We have chosen to go with a PNG tour company for just this reason. I have chosen to go in May because I have heard about the tribal Sing Sings where many of the tribes get together and sing and dance for two days. There are three or four Sing Sings during the year which are open to tourists and have become a huge and rather overwhelming occasion. But there is one, the Tumbuna Sing Sing, which is a smaller affair and only fifty tourists are allowed. We have been fortunate enough to get two of these coveted spots. But before we can do any of this we have to actually get to Papua New Guinea, which is proving to be a problem. We are flying Air Niugini (pronounced New Guinea) from Brisbane to Port Moresby. We have been sitting in Brisbane Airport for over three hours. Boarding has commenced several times, but has been stopped each time. At one stage we actually get halfway down the jetway before we are turned back. There is a technical problem on board. There is also a problem on the jetway. There are maybe thirty of us who have had our boarding passes scanned and are making our way to the plane. Three flight attendants emerge from the plane, form a line across the jetway and herd us back to the terminal. If they could find red flags I am sure they would be waving them. For security reasons, once back inside the terminal we must be prevented from mixing with the other one hundred and fifty passengers who have not had their boarding passes scanned. Ropes miraculously appear and a small holding pen is made for us. We are now corralled like cattle, and it feels as if we are in quarantine. All the Air Niugini frequent flyers are completely unfazed by this. It obviously happens regularly. We are not particularly fazed by this either as we have already been told about the vagaries of traveling in PNG. Once we had paid what we thought was an exorbitant amount of money for the twelve day trip, the tour company sent us an introductory letter in which they went to great lengths to point out that tourism is a new concept for PNG and we should not expect the kind of service that we are accustomed to in other parts of the world. We were warned many times, in bold typeeven, that things are likely to go wrong. Times, schedules and even destinations that appear in our itinerary represent the wish list and are in no way guaranteed. The letter actually asks for our patience and says that we are not to behave like spoiled American tourists when things do go wrong. So we realise that sitting in a holding pen in the middle of the airport is just part of the experience of traveling to PNG and we can handle it. But this is just the start of our first day and things are not going to improve. We soon learn that within hours our patience is going to be stretched to its limits. The flight is just the beginning, and the lovely people of PNG are about to find out that patience is not one of Gordon’s strong points. After a three hour delay we finally arrive at Port Moresby Airport. As soon as we set foot outside the airport we see that the decision to go with a tour company was a wise one. The airport is fenced off from the outside and there are large metal gates that have to be opened to allow people in and out. The sidewalks around the airport are crammed with people just sitting there. They seem aimless. I ask the guide why they are there, but get no answer. Are they waiting for something? Something like an unsuspecting tourist? What ever it is that they are doing, they are clearly not waiting for the next flight to Sydney. A few make an attempt to approach us and one young man even has an IPhone that he is trying to sell. I would love an IPhone at a discounted price, but this might not be the time or place. And presumably a tourist is about to find out that he is missing one. Outside the airport we travel a short distance to the hotel which is again gated, this time with armed guards, and surrounded by a fence. On one side of the street there is a verge of barren earth that stretches back fifty or sixty feet. There are four large trees growing there. Several families live under the trees. They sit there with their few belongs. Some have a tin roof over them and a cooking pot, but most do not. Some look extremely threatening, others just have vacant eyes staring dully at nothing. The ground is dry at the moment but when the rains come these people will be living in a field of mud. It is these people that prey on unsuspecting tourists, and resort to violence to get what they want. They are not friendly in anyway and I am grateful that we are passing through in a van with a driver and guide. Like so many places, the people from the countryside come to the capital looking for work. When they can’t find it they have little choice but to turn to crime. The young men are known as rascals which seems a peculiarly mild term for muggers and murderers. 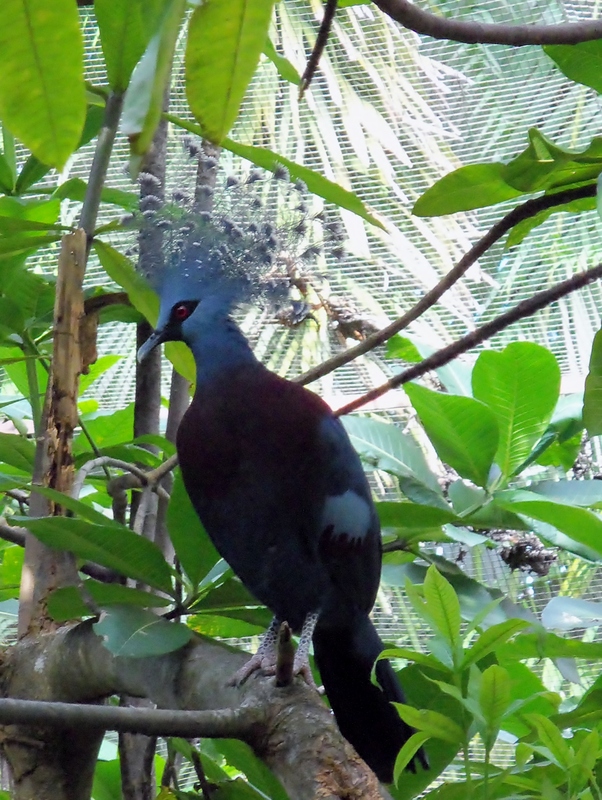 This entry was posted in bird of paradise, Papua New Guinea, PNG, Port Moresby. Bookmark the permalink. 3 Responses to Port Moresby. What’s that smell? Sounds like Paradise! Let’s hope the birds live up to expectations.